I hear many stories of why people are nervous around their horses at the RemoteConfidence clinics I give around the country. In the top three of the ‘things which make me nervous around my horse’ hit parade is always mounting the horse. Now this makes sense to me. Arguably, mounting is when we’re most vulnerable as a rider and it’s also a time where a horse can become easily distracted. My reply to people who list this as a fear is usually “what do you do about that?” Answers vary from ‘just push through it and get on’ to ‘find excuses to not get on at all’ and everything in-between. My return question is this…why aren’t you training your horse to be still and safe whilst mounting? If you’re anything like me the old flexibility and agility isn’t what it used to be! With that in mind why would you risk getting on a horse you know is not going to stand still whilst mounting? Holes in training like this are dangerous for you as a rider and for nervous riders it can send those pesky butterflies into a frenzy which, in turn, starts the vicious circle off for both you and your horse. Additionally if you’re unable to control where your horses feet are whilst mounting what hope does that give you for controlling where they go for the rest of the ride, and, for that matter, any handling you do with your horse! As a riding coach, often to people rediscovering riding or to nervous riders, my absolute number one priority is your safety. The good news is a horse who won’t stand still for mounting isn’t a difficult thing to fix. Like all training, it’s going to take some time and a whole lot of clarity and consistency from you. Let’s look at some of the things we need to consider to make this a success! 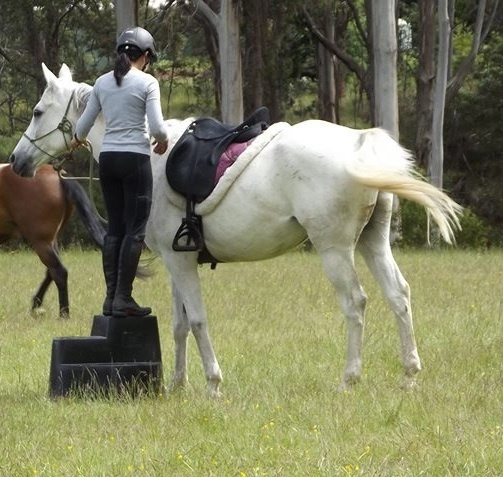 Using A Mounting Block – Even if you’re a light rider I recommend using a mounting block whenever possible to reduce strain on your horses back and stop your carefully placed saddle from slipping out of position. We then need to ensure our mounting block is in a good position. I recommend mounting where you’ve a large clear space around you, just in case something does go wrong. Here’s where I have a little rant and I can’t stress this enough. Get a good mounting block. A plastic crate is NOT a good mounting block. Horses can put legs through them, riders can put legs through them, they become brittle and unstable when out in weather over time. The damn things give me the shudders! If a crate is your only option see if you can fix a solid top onto to increase stability. Even with this I’d be replacing the crate itself every 12 months if it’s out in the weather. My preferred mounting block is the large round ones with the three steps up them. They’re round so they’re both very stable at the base and there are no sharp edges for horse and rider to catch themselves as well as there being three different levels for you to mount from. The sides are also fully enclosed so no legs can go through them. Their downside is unless you’ve a super large car they’re not super portable to take to competitions. They’re also not a cheap purchase but I’ve seen many agistment/boarding centres have a number of people pitch in a small amount to purchase one for all to use. The other options is of course to build a fixed place where you mount. Also great as it will be a solid, stable structure. The downside here being it’s not at all portable. About You – Mounting a horse, particularly a tall one is not always an easy or elegant process. We wish we looked like the tall lithe professional riders springing easily into their 17hh horse but in reality we probably resemble something slightly further down the food-chain scrambling up a mountain! If you’re nervous about mounting and your horse is not being a compliant partner in the endeavour see if you can practice your own technique on a horse who is happy to stand there. This is going to build both your technique and your confidence. Start where you need to start, I’ve done lessons with nervous riders where we’ve practiced getting on and off the mounting block itself without the horse nearby. If you’re not comfortable standing on top of the mounting block, and this advice comes from someone who won’t stand on a chair to change a light-bulb, practice. Practice getting on and off. Get on, step off forwards, step off sideways, step off backwards. Get comfortable being on the mounting block. Once you’re ok with that bring the horse over, get on the mounting block, put your foot in the stirrup, take it out, put it back in the stirrup. Next, time put your foot in the stirrup and mount if you feel ok doing so. Practice the coordination to mount, take your time doing so. I promise you if you feel better about your level or coordination on a quiet horse you’re going to feel better with your own horse. Training – Mounting your horse is NOT about getting on. Yup, you read that correctly. Mounting is like any other ground-work you do with your horse. You’re controlling where they put their feet and when. So, take the scenario you go up to the mounting block and stand on it, horse goes ‘oh I need to walk over there’ you drop everything and follow him, bring him back, get on mounting block, this time you get your foot in the stirrup and he walks off bit it’s ok you’re half on and you’re able to get your other foot in the stirrup before he gets any quicker so it’s fine really, you’re on and you can start work! This is not fine, it’s not fine at all. Your horse has just called the shots and isn’t listening to you, he’s making his own decisions and because you don’t think you’ve ‘started working’ yet he’s just also been taught by you this behaviour is ok! The good thing about this, particularly for nervous riders is you can break this whole process down and work through it at your own pace. First up, will your horse stand without his feet moving regardless of where you are? This part isn’t about being near a mounting block. Can you move confidently to his girth area on near or off side and stand there without his feet moving? Until you can do this successfully, don’t move onto the next step! The next step I’d take from here is whilst standing next to his girth area I’d take up the reins as I would when mounting. If he moves off again you’ve a little bit of work to do until you can take up the reins without his feet moving. He may also be telling something if he shows tension when you take up the reins. Make sure you’ve not accidently put pressure on his mouth when mounting to give him a reason to show displeasure! With this exercise if your horse does move when you take up the reins I’d move his feet. So you take up the reins and he walks forward, move him backwards a step and stop. When his feet are still then release the pressure. The ‘pressure’ in this case is you standing at his girth and taking up the reins like you’d mount. If he does the right thing, drop the reins and come to the front of him and give him a pat, releasing the pressure. Too many people stop the horses feet moving in the first instance and then get on, there’s no real release and the release is where the horse learns. Yes, this may take some time. I promise you if you do take the time to do a few sessions of this you’ll have a horse who’s a pleasure to mount for your riding time to come! I would then do both of these things but now using the mounting block. If you’re training’s been effective it shouldn’t matter you’re on the mounting block. For safety reasons make sure the area around the mounting block is clear. Once again, think about pressure and release. How many of you have seen this occur? Get on mounting block, horse moves away, rider sighs, gets off mounting block gets horse, comes back, repeats. I know I’ve been guilty of this one many, many times! Think about it in terms of pressure and release though….horse stands at mounting block. Horse goes ‘no’ and moves away – pressure from rider is released as they drop reins to get off mounting block. Horse interprets release of pressure as ‘good’ because that’s what most training is – pressure on, pressure comes off when right response is given. So….why should the horse change his behaviour in this scenario? Check he’s understood by going practicing standing next to him and picking up the reins again without the mounting block, then add the mounting block in again. By now you’ll have the idea we’re going to be breaking this training down. The next step is to be able to put your foot in the stirrup, then we half mount, then we mount completely, lastly, our horse waits for your aid to walk away from the mounting block. If you run into trouble at any of the points you’ve just read take a step back, go back to the beginning if needed and consolidate that training. As tempting as it is to just get on and ‘start work’ you’re going to have the same issues tomorrow and the next day and the day after that if you don’t address them at some point. All the training we do is to make the work the next ride better so don’t give that training the opportunity to head in the opposite direction.